Learn how to paint delicate eyebrows! 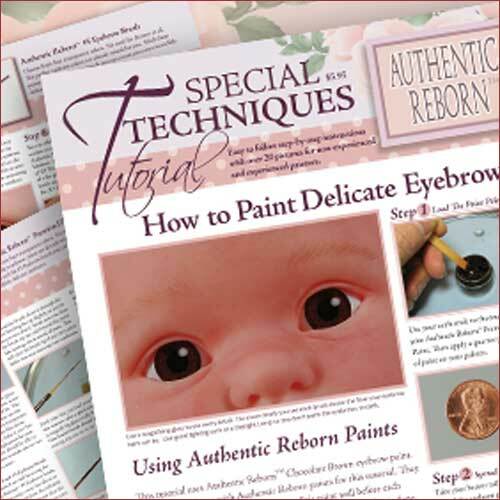 Painting delicate eyebrows on your baby is easier than ever with the techniques you’ll learn from Authentic Reborn™. They know some techniques that you don’t know about. They use better equipment and get better results. Now the veil has been drawn back and you can see what you have been missing. Authentic Reborn™ has just released its newest Special Techniques Tutorial, “How to Paint Delicate Eyebrows”. you can get some of the best teaching in the country on how to paint reborn babies eyebrows like the pros. The three most important things to do to paint ultra fine eyebrows hairs. If you would like to use the same tools and supplies that Pat used in making “How to Paint Delicate Eyebrows” then here is a list that will get you started. The right tools and supplies are half the solution. Learning the right techniques is the other half.